ICYDK, the hair scrunchie is HOT again! The famous '80s and '90s hair accessory that your ate (and probably you, too) wore every day of her school life has been recently spotted on celebs like Jennifer Lopez and Hailey Baldwin. But that's not all—they've been rebranded, too! Danish designer and founder of Comfort Objects (a re-purposed vintage accessory label), Line Sander Johansen, calls them "hair clouds" because she thinks scrunchies "looked like silk clouds around the hair." So, if you're into wearing hair clouds (again? ), here are ideas to get you through the whole week. 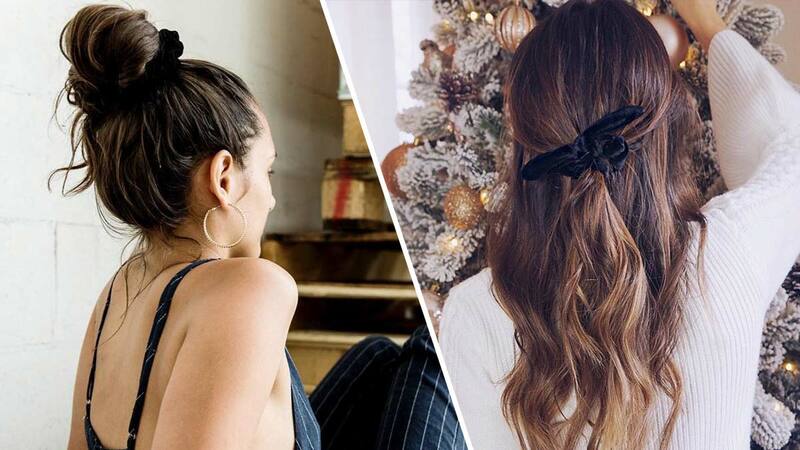 Combining the scrunchie's velvet material with beachy waves makes for one chic look for 2018! It's perfect for when you want to spruce up your hairstyle for brunch or cocktail hour. We love how the size of the scrunchie can add volume and height to your top knot. Going to a garden wedding? Try this fun, eye-catching look! Whether you wear it loose or tight, you'll still get that girl-next-door vibe! Yay for scrunchies that don't look basic at all!